Adrian Owen has had an illustrious career dedicated to answering one question: “Where is the edge of human consciousness?” A renowned neuroscientist currently at the Brain and Mind Institute in Ontario, Canada, Owen has published hundreds of studies on human cognition. More to the point, he is embroiled in a contentious debate among the world’s leading cognitive neuroscientists regarding his claim to have developed methods to detect consciousness in patients who show no outward sign of cognitive awareness. Owen isn’t afraid of end-of-life controversy—he’s compelled by it and, at times, even seems addicted to it. And that’s what makes his new book so illuminating, yet so troubling. 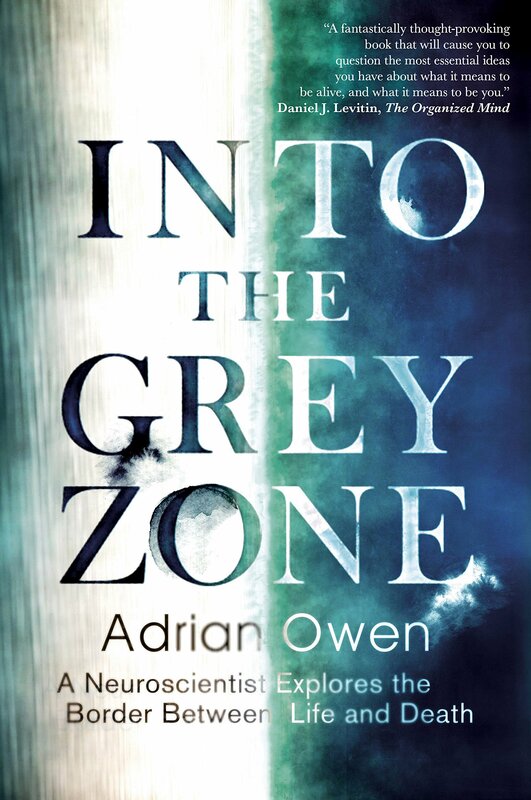 In Into the Grey Zone, Owen embarks on a captivating autobiographical journey that describes his paradigm-shifting neuroscience research, rolling out one startling vignette after another to illustrate his landmark discoveries. His patients have experienced a diverse array of calamities—car accidents, falls, strokes, and violent attacks—that have left them in a vegetative state (what Owen calls “the grey zone”). The book recounts gripping stories of each patient, their loved ones, and the scientists who have demonstrated that even in a seemingly vegetative state, 20% of people are more alive than we ever knew. In fact, they’re awake. No, I’m not kidding—at least 20% of so-called “vegetative” patients are awake. This means that one in five individuals in a comatose, non-responsive state can perceive what we’re doing, what we’re saying about them, and even how we’re treating them. The implications of such findings are enormous, particularly given the ethical dilemmas of removing life support and the ways we attempt to communicate with unresponsive people, especially when they’re loved ones or patients. Even before becoming the contentious scientific figure he is now, Owen was no stranger to “the grey zone.” During his graduate school training at King’s College in London, his lover suffered a debilitating brain injury from a biking accident. Almost simultaneously, his mother succumbed to a fatal brain tumor. His grief and confusion in losing two women so close to his heart lends texture and urgency to the start of his narrative. And after that affecting dive into Owen’s own tribulations, you have no choice but to immerse yourself in the decades-long story of transformative discoveries by his lab (and others) that have redefined our understanding of human consciousness. Owen’s reputation rests on the ingenuity with which he studies patients in “the grey zone.” He describes the development of an innovative technology that has enabled scientists to determine the specific brain regions required for imagination, emotional connection, and understanding. He describes the thin strip of our brains, for example, that fires as we picture ourselves playing tennis, and across the brain, another peanut-sized node that’s illuminated on brain scans as we visualize wandering through our childhood home. The twist? Owen’s research detects this activity in people we typically think of as “brain dead”—hovering at the edge of awareness, comatose, in a vegetative state. Owen’s work has shown that when these vegetative patients are asked to imagine themselves playing tennis or walking through their childhood homes, their brains can fire just like ours. They can perceive and imagine just like us. There’s someone in there. Owen makes this cutting-edge neuroscience accessible with clear language, well-curated metaphors, and the distillation of complex cognitive theories into simple explanations. He covers everything from the unique nuances of each patient’s medical journey to the large-scale ethical implications of Owen’s own research, and how these findings have transformed the Right to Die Movement, living wills, and Theory of Mind (the ability to understand the beliefs, mental states, and perspectives of others as distinct from our own). As the book gets more technical, Owen describes the details of how functional Magnetic Resonance Imaging (fMRI) and Positron Emission Tomography (PET) brain imaging can be used to detect signs of consciousness. His “grey zone” patients will show absolutely no outward signs of consciousness, and then bam! Their brains light up in an fMRI machine like the aurora borealis as they watch a moment of peak tension during an Alfred Hitchcock film. The key to this observation is that areas of brightness appearing in an fMRI brain scan indicate heightened firing activity of the neurons in that region during specific time windows. And the particular brain activity he observes in these patients appears in the same precise location, at the same precise time, in the same precise pattern that your or my brain lights up in response to the most climactic moments of the scene. It’s not random— it’s coordinated. These people are paralyzed, but their minds are not. I’d be remiss to exclude mentioning that these findings are not without controversy—many critics question whether Owen is simply measuring anomalous moments when the brain activity of his patients might match ours due to freak phenomena of serendipity, or if he’s genuinely detecting consciousness. Personally (and I study the brain), I was convinced. What the book discernibly lacks, however, is humility. Owen is out to discover, not to heal, and that air of dispassionate scientific zeal sabotages the reader’s experience of the book. He describes the complicated nature of each case and imbues his writing with genuine admiration for the strength and bravery of the patients and their families. But it is clear throughout that this is a love story between Owen and his own data. His attempts to connect with the reader often lead to collateral heartache, because his findings have only been made possible by devastating human tragedy. There’s the robotics expert who got T-boned in his car and survived for a decade. There’s an 18-year-old who got assaulted just weeks before his high school graduation. There’s a fifty-three-year-old bus driver and father who collapsed with a severe headache and never woke up again. In a particularly troubling passage, we hear from Juan, a young boy who recovered miraculously years after being a subject in Owen’s studies. Juan recounts his experience while being in the brain scanner. Fully aware, he recalls feeling so much fear during the experiments that he “cried, even if not able to produce the tears.” He still feels anger and a sense of betrayal when describing his experience years later to Owen. Why didn’t the experimenters explain better what was going on? He had no idea why he was in a scanner in the first place. As a result, this young man felt trapped and panicked, literally paralyzed within the fMRI machine, with no one to comfort him in this moment of scientifically-induced duress. As I read Juan’s account, I felt grateful for the limits imposed by ethics committees that oversee these studies, and found myself wondering aloud how far Owen would have pushed if left unconstrained. While he ultimately expresses remorse for these mistakes, we never feel confident that he truly understands the enormous emotional costs of his research, and many readers may, like me, struggle with this paradox: we cringe at Owen’s ethical flaws while simultaneously giving him credit for openly grappling with them as he explains his brilliant discoveries. As boisterous as is his self-praise, he also doesn’t hide the messy truths of his research career. Despite its flawed narrator, Into the Grey Zone does have immense emotional depth, most notably exemplified by the dedication of family members for the afflicted subjects. The devotion these people display is breathtaking and inspiring—they sleep in hospitals for years, they take their unconscious loved ones to weekly movies, and they never give up hope that their special someone is still “in there” and alive. The sheer courage these people show as they persevere despite unthinkable tragedies inspired me. And when the conscious patients do manage to communicate, they bear an enormously comforting message as well: to an astounding degree, patients in a vegetative state are not in pain and they do not want to die. As the book came to a close, I felt mesmerized, but grief stricken. To be honest, I took it all personally, and here’s why: I study the brain, too, and I study why it breaks. I wonder each and every day, “Are we doing the right thing? Are we doing it the right way?” In molecular neurobiology, we rarely think mechanistically about how socioeconomic disparities impact our brains and we are only beginning to understand how emotional trauma impacts our health. It was horrifying to me to learn that if a family talks to their unconscious loved ones, the patient is not just more likely to recover, but this paralyzed person may very well hear us and feel less alone. Why is this so horrifying? Because I have studied neuroscience and pathology my entire adult life, and at no point did a textbook or mentor ever point out that comatose patients are sometimes awake in there, that one in five can hear us. Furthermore, each and every experiment that Owen conducted was done outside of the health insurance system. Hence, the only way you can know if your loved one is really awake, despite their vegetative state, is if you have a small fortune to pay for these tests or if you have the privilege of being selected for these studies—studies that may end up traumatizing you like Juan was. In so many ways, we’ve missed a larger point. We fail to recognize how much privilege matters in brain injuries, too. Having a quality caregiver, attentive family, resources, health insurance, and access to knowledge all have vast implications that may determine whether you will ever escape “the grey zone” or not, and how alone you may feel while there. The availability of a top-tier, sometimes pretentious, intrepid neuroscientist team may very well dictate if your family knows you’re awake or not and if you’ll be treated as a human or a specimen. It’s easy to think about disparities in wealth and political power in terms of taxes, but it’s moments like these that illuminate how deep our system of inequality really goes, and the life or death implications of not knowing the science of consciousness in a moment of crisis. To which I ask: What is scientific discovery worth if it is not coupled with the mission of disseminating its findings to diminish human suffering? At what cost to the individual test subject do our insights into humanity come? How do we make science more compassionate, more whole? Julia Derk is a PhD Candidate at NYU School of Medicine studying why the brain becomes inflamed in Alzheimer’s disease in honor of her grandmother, Rana, whom she loved deeply and lost to “the grey zone” as a young child.